It is through immersive, hands on, participatory experiences in nature that connections to the wild are made deepest. Rather than making a craft and hanging it on the wall, you use it. Rather than admiring the forest from afar, you are part of it. This is the experience we are creating with this program. 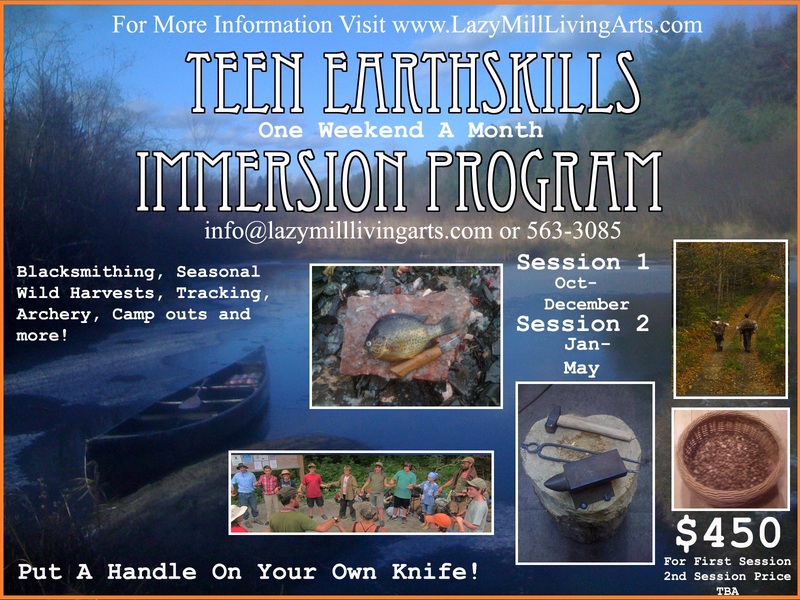 Come join us at Lazy Mill Living Arts for our one weekend-a-month teen program. At each meeting we will learn what it takes to camp out and be comfortable during that part of the year. In December this might be in a wall tent with a wood stove. Our focus will be on the nearest seasonal wild harvest, from acorns to muskrat. In addition to harvesting these foods we will learn how to preserve and cook with them. We will also make tools and crafts useful to living with the land, such as hafting a knife or carving a digging stick. Other skills and activities will include blacksmithing, archery, tracking and games. Please bring lunch for each day. Dinner and breakfast provided. As always, we strive for local and organic foods in all our meals. Cheers on your enthusiasm to educate others in these skills! Maybe you should consider some form of voluntary electronic device forfeiture to really get those teens outwardly focused? I’m curious as to how the last re-wilding class went. I don’t mean that in a “prove to me this would be a worthwhile class” way, just remembered hearing about one scheduled for august, then never heard about it again. Not that I am owed that news. I am just intensely curious about how your recent ambitions are going/went, but can’t come up to VT to shake your hand. Congrats, Ben! A great beginning at the new property. And a very much needed course for our youth​. Are you planning adult courses, too? Congratulations on your efforts and bravery to add this to your busy schedules! Sounds like a great opportunity for the young people. We’ll be growing into those shoes and hopefully one day can join your school. I am assuming this is a joint effort with friends and local wilderness masters, nice work! Are you guys still holding the bacon camp or did that need to be pushed out? The pictures on the Lazy Mills site are wonderful, you can just feel the crunch of those apples and all. Bacon camp will have to wait. Gotta get a roof over our heads first. Me, too! When I was a teen I would have wanted to go to this so much! Now that I’m not a teen I still want to go! If I wore braids and painted freckles on my face could I pass???? This is the only thing that could make me wish I were 13-17 years old again. Sounds incredible!